Euonymus, heucheras, pieris, aubrieta, heathers, snowdrops. A really lovely photograph. You can just about 'feel' springtime in this pic. 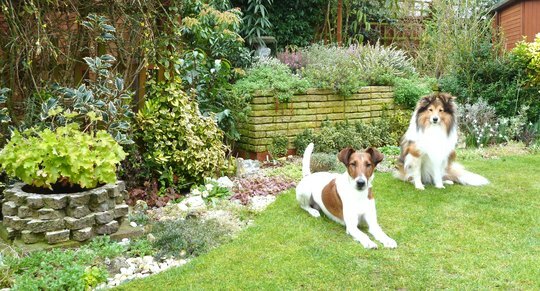 Your dogs look in superb condition as does your garden! I decided to take some pics before the rain encouraged the grass to grow long again... Lol. I'm pleased I built the wall.. the evergreens have grown nicely .. I don't know how you do it Terra! Thanks Moti, Angie and Pam ..
My goodness Terra, your garden looks wonderful!...cutting the grass? Daffodils flowering? are we in the same country? I've got snowdrops and crocus and the odd bit of new growth here and there, but nothing as far on as yours. You are lucky. It must be the effect of having such dedicated helpers lol! Lovely garden & lovely dogs TT. Glad you have helpers! Your garden looks wonderful year round Terra. Love your dogs. They sure know how to pose. Today Team Terra was sheltering from the rain ! Your garden and helpers are looking great. Our garden is coming along but now we are being threatened with snow this weekend. If we get sun at Easter I feel that will be the sum total of our summer so intend to enjoy it. We have been shivering for days because of a strong north easterly. the plants are benefiting ..
Hi Scotsgran ... Pleased you like this .. I hope you don't get too much snow ! The pebble borders have been successful ..